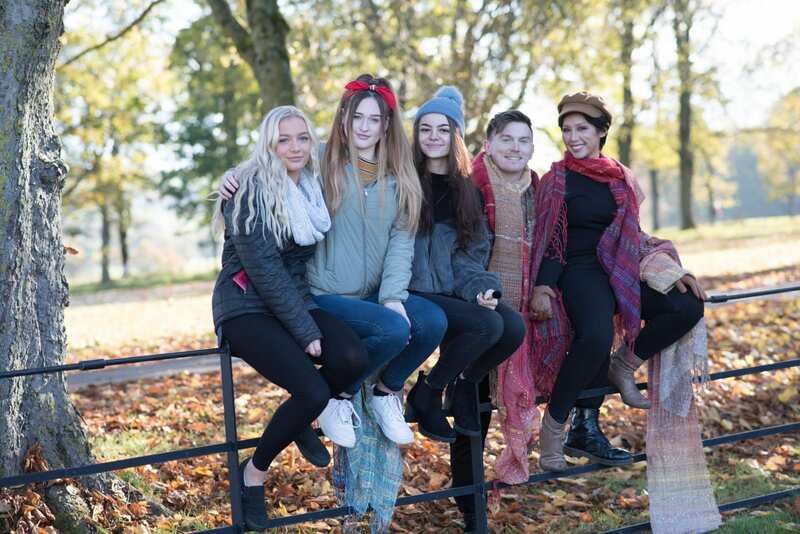 A trio of Nelson and Colne College students experienced the buzz and demands of a front page photoshoot when they were invited to style models for the 2019 edition of Burnley Lifestyle Magazine. Jenna Nuttall, 17, Chloe Backhouse, 16, and Katie Hartley, 16, who are all on NCC’s Level 2 Hair and Beauty Pre-Apprenticeship programme, worked on the upcoming magazine’s fashion feature in the stunning surroundings of Towneley Hall, Hurstwood Hall and Hurstwood Reservoir in Burnley. Featuring scarves, shawls, tunics and coats all hand made by Burnley company Transform Crafts, the girls worked hard throughout the event on different make-up styles for photoshoot models Pailin and Josh. The event, which was sponsored by Lloyds of Colne, also featured a new BMWi8 hybrid prop for the occasion. Katie, formerly of Colne Primet Academy, said: “I really enjoyed it and had a lot of fun. It was really good to be outside working on a real set – it was a different experience than being in the classroom. Jenna, who attended Ss John Fisher and Thomas More RC High School prior to coming to NCC, said: “I love working with make-up and it was a really good opportunity to get creative in that area. By having the chance to work on the new Burnley Lifestyle Magazine photoshoot, Jenna, Chloe and Katie were following in the footsteps of previous students Elise Munroe and Georgia Leeming who worked on the event for the 2018 edition’s cover piece. Elise completed her College course at the end of the last academic year and progressed into employment at Laura Nazir Make-Up Studio in Nelson, while Georgia is now completing a Beauty Apprenticeship at Little Day Spa in Rochdale. Claire Pye, Head of Section for Hair and Beauty at Nelson and Colne College, said: “The photoshoot with Burnley Lifestyle Magazine is an invaluable occasion for some of our Hair and Beauty Pre-Apprenticeship students to improve the practical skills they learn within their College course, as well as develop other important skills such as confidence, communication and teamwork. “After the success of last year’s photoshoot with Elise and Georgia, it was a privilege to be invited back again to work on next year’s edition and the girls were an asset to the College. Joanne Etherington, Editor of the Burnley Lifestyle Magazine, said: “The Burnley Lifestyle Magazine promotes the leisure offer in the local area, the fantastic countryside, places to stay and eat, with features on local entrepreneurs, artists and crafts people. “We try and keep everything local, using local models and suppliers, and we were delighted to have three Hair and Beauty students from Nelson and Colne College working with us to create the moody Autumn look we wanted to achieve in the feature. In its 2017/18 results, NCC achieved a 99.6% pass rate in advanced vocational courses. Nelson and Colne College has been rated as Outstanding by Ofsted since 2005. It is also the top college in the country for 16-18 learner achievement, at all levels. Government data places NCC as the best college in the area for vocational courses, based on progress scores, while it is also the best college in Lancashire for student satisfaction, according to the FE Choices Learner Satisfaction Survey.